The besst Vietnamese & Indochinese Endemics. Our special itinerary is designed to visit key sites in Central and Southern of Vietnam and to visit three Endemic Bird Areas (Kon Tum, Da Lat and Southern Lowland forest). 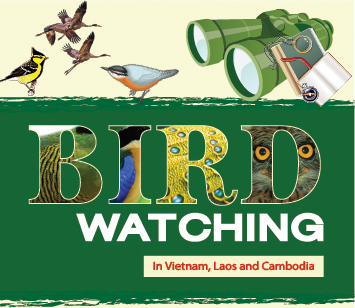 We will look for our main targets; they are endemic to Vietnam and Indochina, with recently discovery of several birding spots in Kon Tum provinces, we will have best chance to see most of Vietnamese & Indochinese endemics. Highlighs: Golden-winged Laughingthrush, Chestnut-eared Laughingthrush, Yellow-billed Nuthatch, Black-hooded Laughingthrush, Rachet-tailed Treepie, White-winged Magpie, Mekong Wagtail, White-rumped Falcon, Vietnamese Cutia, Grey-crowned Crocias, Black-crowned Fulvetta, Collared Laughingthrush, Black-headed Parrotbill, Indochinese Green Magpie, Orange-breasted Laughingthrush, Germain Peacock Pheasant, Orange-necked Partridge, Bar-bellied Pitta, Blue-rumped Pitta.